This is one of the most popular dishes during Holy Week and Easter during Lent. The dried shrimp patties are bathed in a red sauce made of guajillo chile, chipotle, tomato, garlic and onion, where they swim with chopped nopal cactus and eggs, which are previously fried. Everyone knows a turnover and shrimp make their appearance here, too. There are those who only add shrimp, others add cheese with their shrimp, and there are others who stuff them with a shrimp casserole made of shrimp, tomatoes, onion, serrano chile and cilantro. Nayarit’s classic zarandeado style is usually reserved for fish, but shrimp and even octopus receive this tasty treatment. The shrimp are cut in half and then smoked bathed in the secret recipe from each region. Even though these are sold in almost every corner of Nayarit, they’re tastiest in the central coast and the northern part of the state. Not everyone knows how to make the perfect dough, the exact amount of what chiles, spices and fat to use… it’s an art! Their name is thanks to their reddish color and spicy flavor. This is one of the simplest and most delicious dishes. Basically you fry the shrimp in butter with salt and pepper to taste, then add ketchup and Huichol sauce, bring to a boil and then just enjoy!! This cocktail is something you’ll find at nearly every seafood restaurant. Some places prepare it cold, but in Nayarit, we make it hot. One of the secrets of our recipe is to grind the shrimp heads and add them to the consommé to give it extra flavor. When serving as a cocktail it comes with chopped onions, tomatoes, cucumber and green chile as a garnish, plus a squeeze of lime to top it off. For starters, let’s make it very clear this has nothing at all to do with roaches! This traditional dish is basically crunchy shrimp. You take the fresh shrimp, sprinkle with flour, salt and pepper then fry until golden and just right. The ceviche is closer to the top of the list. This is one of those dishes that aren’t native to Nayarit but to the entire Mexican coast and even in the interior. There are an enormous variety of styles, it can be made with cooked, raw or dried shrimp, and there are special ingredients only limited by the chef’s imagination. Basically though, you mix the shrimp with cucumber, onion, tomato and cilantro in lime juice, salted and peppered to taste. 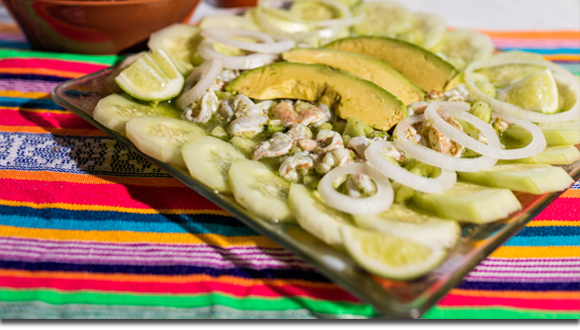 Even though there’s an actual dispute between Nayarit and Sinaloa as to who created this dish, truth is it’s a regional favorite. The aguachile recipe is very simple: lime, green or serrano chile, garlic, salt and pepper. The sauce is poured over peeled shrimp, onion and cucumber. Then you wait a few minutes and then enjoy the spicy treat! Whether they’re wrapped in a flour or corn tortilla, au natural or breaded, shrimp tacos can be served every which way and they’re still great. Don’t forget to eat them with a side of mulata sauce, chipotle or cilantro dressing, with sliced cabbage and onion steeped in lime and habanero chiles, or just a simple salsa mexicana.